Originally released in 2005, Pathologic is a first-person horror-adventure in which you play one of three characters investigating a plague that has gripped an ancient, isolated village in the Russian Steppe. Science can't help, prayer can't help, and most likely you can't help either, but here you are anyway. It's a game that inspires something similar to, but just short of, excitement in a very small number of gamers, for reasons Phil cited a couple of years ago: It's interesting, ambitious, and intensely strange. It was also, as he noted, broken in a great many ways, from straight-up bugs to wonky translations from the original Russian. It's why I have such high hopes for the Pathologic remake that was successfully Kicktarted last year, and why I was really happy to learn that Pathologic Classic HD is on its way to Steam, GOG, and Humble. 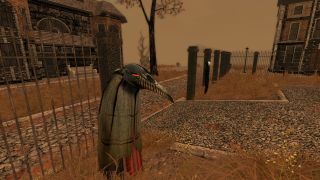 Pathologic Classic HD is a "fully remastered" do-over, with updated graphics, innumerable bug fixes, and a completely redone English script, with new voiceovers and restored dialog. That's really the biggest bit of news here; bugs can be fixed, after all, but pervasive incoherence is an entirely separate matter. The fact that the new English script is cited as the first enhancement on Steam—"The game has cast off the major issue that had previously disallowed international audiences from accessing it," it says—speaks volumes. To be clear, this is an entirely separate release from the Pathologic remake, which developer Ice-Pick Lodge is still working on. Pathologic Classic HD is being handled by General Arcade, which has previously restored the original Shadow Warrior and Duke Nukem 3D. Ice-Pick Lodge said in a statement that it decided to re-release Pathologic because some elements of the remake "have strayed rather far from the original," and it doesn't want to exclude players who prefer the game in its original state. "This way, the original Pathologic will always be available to you even if you come to disagree with the changes made in the Remake," the studio said. "And if you haven't played it at all, you'll have a chance to get to know the game that has defined us as a studio in a definitive way."